Americans are trapped in a dysfunctional healthcare system fraught with perverse incentives that raise costs, reduce quality, and make care less accessible. Now Priceless cuts through the politics and proposes dozens of bold reforms to free patients and caregivers to be empowered to chart their own lives with low-cost, high-quality healthcare. Dr. Goodman received his Ph.D. in economics from Columbia University, and he is the author of nine books and more than fifty studies on health policy, retirement reform and tax issues. He regularly appears on Fox News Channel, CNN, PBS, Fox Business Network and CNBC, and his articles have appeared in The Wall Street Journal, Forbes, USA Today, Investor’s Business Daily, National Review, Health Affairs, Kaiser Health News, Psychology Today, and other national publications. 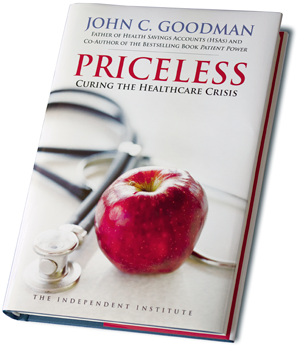 John Goodman's book Priceless is revolutionizing thinking the debate over healthcare policy. He characterizes healthcare as a “complex system” that cannot be managed from the top down. True reform requires liberating doctors and patients by allowing them to interact in innovative ways to help meet unique individual medical needs. The most important problems that plague American healthcare arise because we are trapped. Virtually all of us—patients, doctors, caregivers, employers, employees, etc.—are locked into a system fraught with perverse incentives that raise the cost of healthcare, reduce its quality, and make care less accessible than it should be. —Peter R. Orszag, former Director, Congressional Budget Office; Vice Chairman, Global Banking, Citigroup, Inc.
—Angela F. Braly, former Chairman and Chief Executive Officer, WellPoint, Inc. Thu., Jun. 27, 2013 John C. Goodman, author of Priceless: Curing the Healthcare Crisis will speak and sign copies of his book on Thursday, June 27, 2013 at 6pm PDT in Portland, OR. Hosted by the Cascade Policy Institute, the event will be held at Ernestos Italian Restaurant, 8544 SW Apple Way. Mon., Nov. 12, 2012 John C. Goodman to address Opening Keynote Session about Priceless at the 9th Annual American Health Care Congress, Anaheim, Calif.
Fri., Oct. 5, 2012 John C. Goodman to speak about Priceless at the annual convention of the Association of American Physicians and Surgeons, San Diego, Calif. Thu., Oct. 4, 2012 John Goodman to speak and sign copies of Priceless at The Independent Institute in Oakland, CA Thursday, October 4, 6:30pm. Tue., Jul. 24, 2012 John C. Goodman to speak on Priceless: Curing the Healthcare Crisis at the Heritage Foundation in Washington, D.C. Tue., Oct. 21, 2014 Are Placebos Ethical? Sr. Fellow John C. Goodman, author of Priceless Op-Ed in Forbes? Thu., Jun. 19, 2014 Sr. Fellow John R. Graham testifies before House Committee focusing on insurance company bailout provisions of Obamacare. Sat., Nov. 2, 2013 Obamacare Rollout Sr. Fellow John R. Graham appears on WYPV-FM radios Pastor Gary Biggs show. Tue., Oct. 15, 2013 Obamacare Explained Sr. Fellow Lawrence McQuillan appears on WDAYs Jay Thomas Show to explain Obamacare. Fri., May. 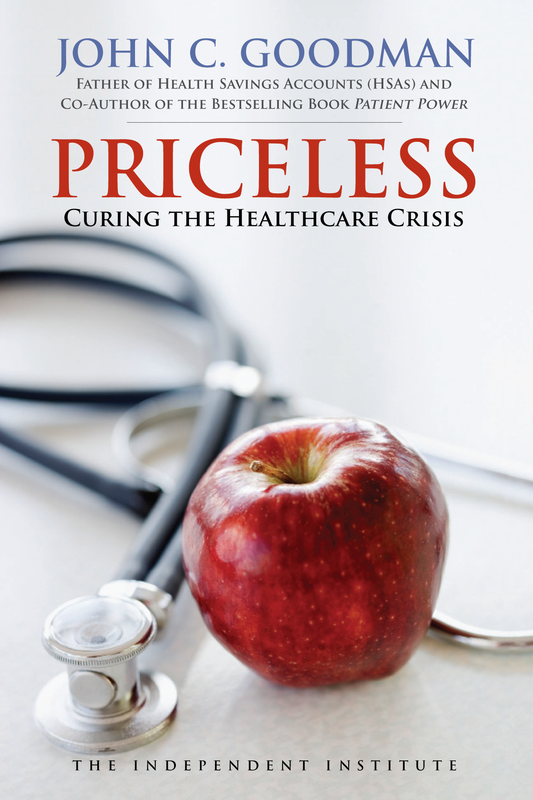 17, 2013 Priceless: Curing the Healthcare Crisis By John C. Goodman Wins 2013 Eric Hoffer Award for Culture and Silver Medal from the Independent Publishers Book (IPPY) Awards. Sat., Mar. 16, 2013 Bait and Switch John C. Goodman, author of Priceless in TownHall.com on Budget Forecasts that Arent Real. Fri., Mar. 8, 2013 A Conversation on Health Insurance with John Goodman John C. Goodman, author of Priceless appears on Eye to Eye podcast from Ayn Rand Center. Tue., Nov. 20, 2012 John C. Goodman, author of Priceless appears on Tim Constantine Radio Show on WFOY-AM in Jacksonville, FL. Thu., Nov. 1, 2012 John C. Goodman, author of Priceless to appear on the nationally syndicated Wall Street Business Networks radio show The George Jarkesy Show Tuesday, November 6, 5:20pm EST. Wed., Oct. 10, 2012 John C. Goodman to appear on nationally syndicated radio show Point of View with Kerby Anderson and Penna Dexter on Fri. Oct. 19 at 3pm Eastern Time. Tue., Oct. 9, 2012 Priceless author John C. Goodman appears on The Gary Rnel Show on WPHT radio in Philadelphia. Tue., Aug. 28, 2012 Priceless author John C. Goodman in The Institute for HealthCare Consumerism blog: Irritating Things in the Obamacare discussion. Tue., Aug. 21, 2012 John C. Goodman in RightSideNews.com Ryans market reforms on Medicare give his plan slight edge over Presidents. Tue., Aug. 21, 2012 Nationally Syndicated Salem Radio Network Janet Mefferd Show interviews Priceless author John Goodman. Mon., Aug. 20, 2012 The Free Press of Mankato, MN discusses John C. Goodmans Wall Street Journal opinion regarding unintended consequences of Obamacare. Mon., Aug. 20, 2012 Politics blog at San Francisco Chronicle cites John C. Goodmans Wall Street Journal article on Why the Doctor Cant See You from ObamaCare. Mon., Jul. 2, 2012 ALERT: Research Fellow John C. Goodman to be on Christian Broadcasting Networks Newswatch program at 4pm ET, July 2. Tue., Jun. 19, 2012 ALERT: John C. Goodman to be on Geraldo Riveras radio show Tuesday, 6/19 at 11:20 ET to discuss the release of his new book Priceless: Curing the Healthcare Crisis. Tune in! Tue., Jun. 19, 2012 NEW RELEASE: Purchase your copy of John C. Goodmans groundbreaking book Priceless: Curing the Healthcare Crisis TODAY!